November 19, 2017 0 comments on "How to Clean Rusty Colored Shower Curtains"
Q: I am always having to buy new shower curtains because I have such hard water and the bottoms of the shower curtains always end up rusty colored after about a month. I’m trying to figure out why my shower curtains keep turning orange. I have tried washing them in regular tide and OxyClean, nothing works. Our favorite tip: Have you tried something called “Wink” it comes in a brown squeeze bottle. You can order it from Amazon. Around here we have a store called “Meijer” (sort of like a Super Walmart) and I find it where the have scrub brushes, dye remover, and heavy duty cleaning supplies. If you can find it, it makes rust stains disappear like magic (for some reason, my husband gets rust stains on his clothes), but be careful, it’s poison. Tip #1: I have found that if you put a very small amount of water (just enough to cover the curtain) and before adding the curtain add a very small amount of CLR (or any product like that; it doesn’t have to be that brand name) and a little bit of dawn (now this time I do recommend dawn). Swish it (using rubber gloves if you prefer) until it is blended. Then add the curtain and let it soak about 15 minutes. Hints from Heloise says that if you soak anything over 30 minutes that you risk soaking the dirt, etc back in. 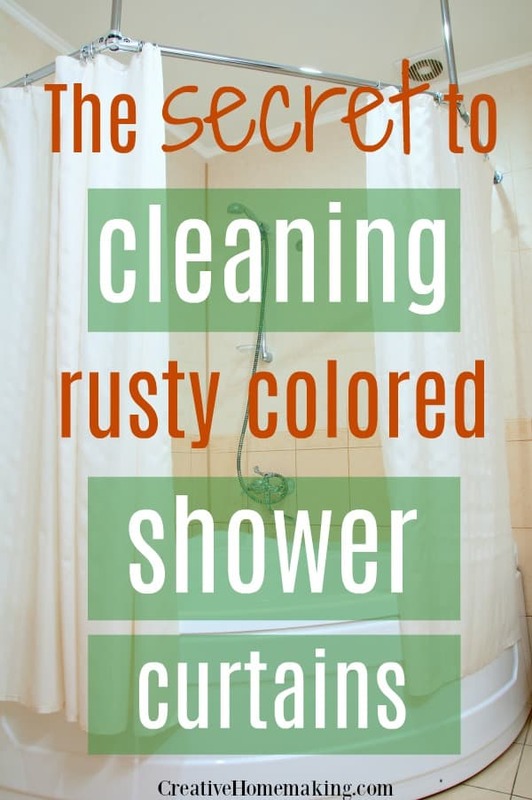 Tip #2: Throw the rusty shower colored curtain in the washing machine with a couple old towels and a little bit of bleach. Won’t hurt them at all and they’ll come out looking brand new. Don’t put them in the dryer, just hang them back up wet and they’ll lose all the wrinkles as they dry. I’ve had my current shower curtain since my husband and I got married 9 years ago!! I wash it about once every two months and it looks brand new. Tip #3: I had that same situation happening in my bathrooms. 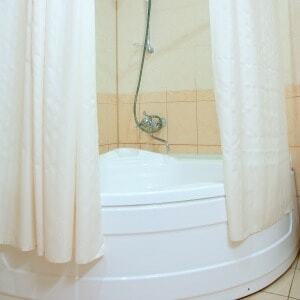 When showering, the curtain must be inside the tub to prevent water from spraying everywhere …I finally realized that it doesn`t have to go all the way to the BOTTOM of the tub. What I did was simply cut a strip from across the bottom of the shower curtain. It still prevents water from spraying everywhere but the curtain doesn’t touch the bottom of the tub where it would just sit in water, soap, shampoo and body oil. It works great. Hope this helps. Tip #4: I too have lots of rust in my water. I keep a spray bottle with 1/2 bleach and 1/2 water under the bathroom sink and every 3 or 4 days I spray the inside of the curtain in the areas that have rust/mold and they completely disappear. Hope this helps. Tip #5: I have VERY HARD water. I have found that if I use a little YELLOW OUT and a little laundry soap in my washer my shower curtain comes out like new. Tip #6: Had the same problem a long time ago so I got my solution at the dollar store its called oxi-magic it comes in a spray bottle just spray it on the area that is stained and soak in hot water also with palmolive dishwashing soap for one day and then wash it in with your towels do not dry it just hang it up and it will dry itself. You will see the differences afterwards. Tip #7: I actually have two shower curtains hanging on my rod – a decorative one on the outside and a clear one one the inside. I just put the clear one on the inside of the tub while showering, and the decorative one remains on the outside. Every couple of months I remove the clear one and toss it in the laundry with a few towels, then remove it from the washer and hang it up. Tip #8: I too have found that Iron Out is the best product to remove rust from shower curtains. I add a couple of white towels to help scrub them and they all come out nice and white. Just hang back on the rod to dry and everything is nice and white again, including your washer. If you have problems with rust stains on your sinks, tub, shower, etc. the Wink product mentioned above does a great job on those.